Notes: Back in 2008 when I made the first version of Peanut Denise asked for one in earthtones. 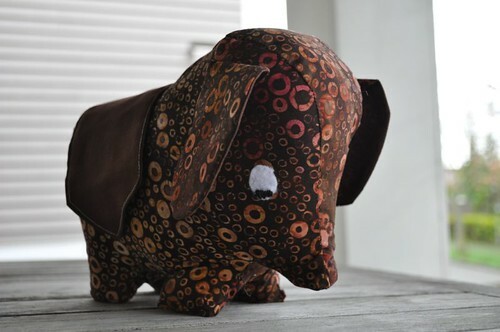 I immediately went out and got the batik to make this elephant for her. I cut out the pattern. And then I let it sit for well over a year because...I can't say. I am lame. I finally put the poor fellow together in January during my sewing bee. And then it sat forever around the house because...I don't know. I am lame. Anyway I finally got the poor little fellow to the post office and off to Denise. Or more importantly to Kira. And I'm so glad I did.